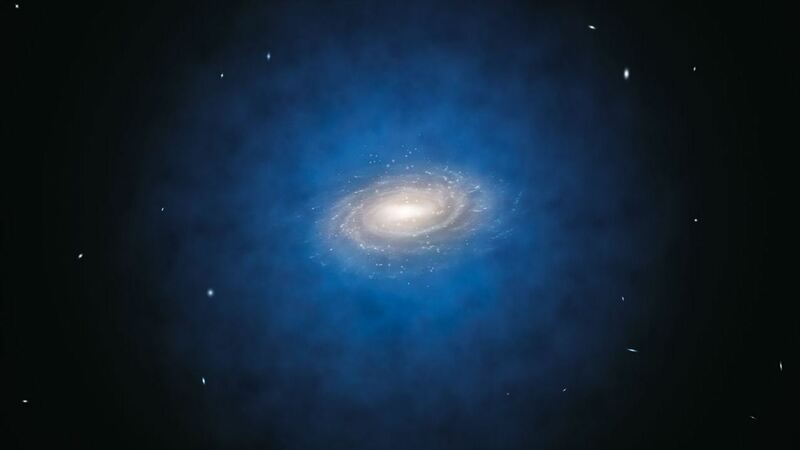 The cold dark matter (CDM) model faces persistent challenges on small scales. In particular, taken at face value, the model significantly overestimates the number of satellite galaxies around the Milky Way. Attempts to solve this problem remain open to debate and have even led some to abandon CDM altogether. However, current simulations are limited by the assumption that dark matter feels only gravity. Here, we show that including interactions between CDM and radiation (photons or neutrinos) leads to a dramatic reduction in the number of satellite galaxies, alleviating the Milky Way satellite problem and indicating that physics beyond gravity may be essential to make accurate predictions of structure formation on small scales. 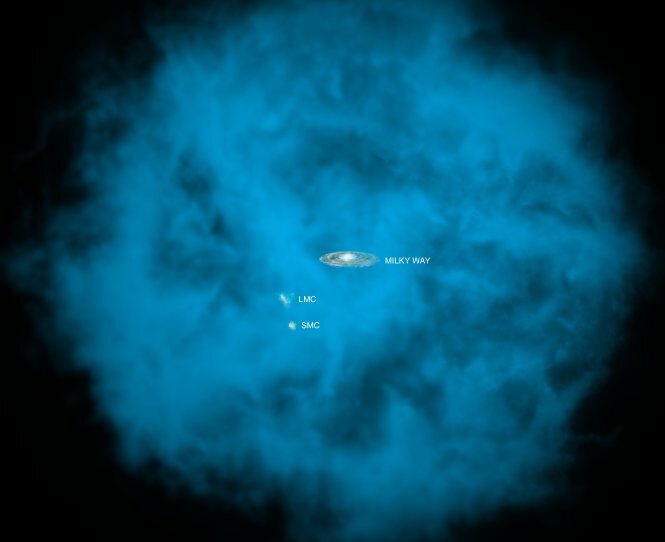 This artist’s illustration shows an enormous halo of hot gas (in blue) around the Milky Way galaxy. Also shown, to the lower left of the Milky Way, are the Small and Large Magellanic Clouds, two small neighboring galaxies. The halo of gas is shown with a radius of about 300,000 light years, although it may extend significantly further. Data from NASA’s Chandra X-ray Observatory was used to estimate [link to press release] that the mass of the halo is comparable to the mass of all the stars in the Milky Way galaxy. If the size and mass of this gas halo is confirmed, it could be the solution to the “missing-baryon” problem for the Galaxy. In a recent study, a team of five astronomers used data from Chandra, ESA’s XMM-Newton, and Japan’s Suzaku satellite to set limits on the temperature, extent and mass of the hot gas halo. Chandra observed eight bright X-ray sources located far beyond the Galaxy at distances of hundreds of millions of light years. The data revealed that X-rays from these distant sources are selectively absorbed by oxygen ions in the vicinity of the Galaxy. The nature of the absorption allowed the scientists to determine that the temperature of the absorbing halo is between 1 million and 2.5 million Kelvins. Other studies have shown that the Milky Way and other galaxies are embedded in warm gas, with temperatures between 100,000 and one million degrees, and there have been indications that a hotter component with a temperature greater than a million degrees is also present. This new research provides evidence that the mass in the hot gas halo enveloping the Milky is much greater than that of the warm gas. Serious Blow to Dark Matter Theories? The most accurate study so far of the motions of stars in the Milky Way has found no evidence for dark matter in a large volume around the Sun. According to widely accepted theories, the solar neighbourhood was expected to be filled with dark matter, a mysterious invisible substance that can only be detected indirectly by the gravitational force it exerts. But a new study by a team of astronomers in Chile has found that these theories just do not fit the observational facts. This may mean that attempts to directly detect dark matter particles on Earth are unlikely to be successful. A team using the MPG/ESO 2.2-metre telescope at ESO’s La Silla Observatory, along with other telescopes, has mapped the motions of more than 400 stars up to 13 000 light-years from the Sun. From this new data they have calculated the mass of material in the vicinity of the Sun, in a volume four times larger than ever considered before. Dark matter is a mysterious substance that cannot be seen, but shows itself by its gravitational attraction for the material around it. This extra ingredient in the cosmos was originally suggested to explain why the outer parts of galaxies, including our own Milky Way, rotated so quickly, but dark matter now also forms an essential component of theories of how galaxies formed and evolved. Today it is widely accepted that this dark component constitutes about the 80% of the mass in the Universe , despite the fact that it has resisted all attempts to clarify its nature, which remains obscure. All attempts so far to detect dark matter in laboratories on Earth have failed. By very carefully measuring the motions of many stars, particularly those away from the plane of the Milky Way, the team could work backwards to deduce how much matter is present . The motions are a result of the mutual gravitational attraction of all the material, whether normal matter such as stars, or dark matter. Astronomers’ existing models of how galaxies form and rotate suggest that the Milky Way is surrounded by a halo of dark matter. They are not able to precisely predict what shape this halo takes, but they do expect to find significant amounts in the region around the Sun. But only very unlikely shapes for the dark matter halo — such as a highly elongated form — can explain the lack of dark matter uncovered in the new study . The new results also mean that attempts to detect dark matter on Earth by trying to spot the rare interactions between dark matter particles and “normal” matter are unlikely to be successful. “Despite the new results, the Milky Way certainly rotates much faster than the visible matter alone can account for. So, if dark matter is not present where we expected it, a new solution for the missing mass problem must be found. Our results contradict the currently accepted models. The mystery of dark matter has just become even more mysterious. Future surveys, such as the ESA Gaia mission, will be crucial to move beyond this point.” concludes Christian Moni Bidin. According to current theories dark matter is estimated to constitute 83% of the matter in the Universe with the remaining 17% in the form of normal matter. A much larger amount of dark energy also seems present in the Universe, but is not expected to affect the motions of the stars within the Milky Way. The observations were made using the FEROS spectrograph on the MPG/ESO 2.2-metre telescope, the Coralie instrument on the Swiss 1.2-metre Leonhard Euler Telescope, the MIKE instrument on the Magellan II Telescope and the Echelle Spectrograph on the Irene du Pont Telescope. The first two telescopes are located at ESO’s La Silla Observatory and the latter two telescopes are located at the Las Campanas Observatory, both in Chile. A total of more than 400 red giant stars at widely differing heights above the plane of the galaxy in the direction towards the south galactic pole were included in this work. Theories predict that the average amount of dark matter in the Sun’s part of the galaxy should be in the range 0.4-1.0 kilograms of dark matter in a volume the size of the Earth. The new measurements find 0.00±0.07 kilograms of dark matter in a volume the size of the Earth. This research was presented in a paper, “Kinematical and chemical vertical structure of the Galactic thick disk II. A lack of dark matter in the solar neighborhood”, by Moni-Bidin et al. to appear in The Astrophysical Journal. Scientists at the Naval Research Laboratory are part of an international team that has pooled their radio observations into a database, producing the highest precision map to date of the magnetic field within our own Milky Way galaxy. The team, led by the Max Planck Institute for Astrophysics (MPA), used the database they created and were able to apply information theory techniques to produce the map, explains NRL’s Dr. Tracy Clarke, a member of the research team. “The key to applying these new techniques is that this project brings together over 30 researchers with 26 different projects and more than 41,000 measurements across the sky. The resulting database is equivalent to peppering the entire sky with sources separated by an angular distance of two full moons.” This incredible volume of data results in a new, unique all-sky map that gives scientists the ability to measure the magnetic field structure of the Milky Way in unparalleled detail. The map shows scientists a quantity known as Faraday depth, a concept that depends on magnetic fields along a specific line of sight. The research team created the map by combining the more than 41,000 individual measurements using a unique image reconstruction technique. The researchers at MPA are specialists in the new discipline of information field theory. Dr. Tracy Clarke, working in NRL’s Remote Sensing Division, is part of the team of international radio astronomers who provided the radio observations for the database. 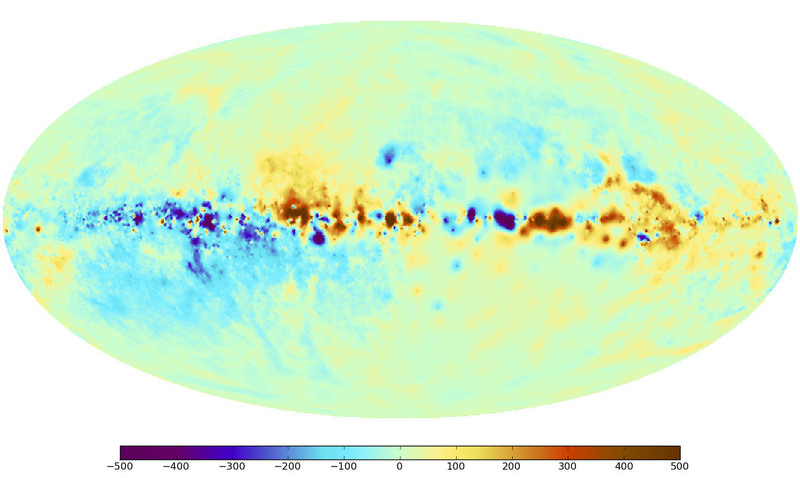 The new, high-precision map not only shows the Galactic magnetic field’s structure on large scales, it also reveals small-scale features that help scientists better understand turbulence in the Galactic gas….. This magnificent 360-degree panoramic image, covering the entire southern and northern celestial sphere, reveals the cosmic landscape that surrounds our tiny blue planet. This gorgeous starscape serves as the first of three extremely high-resolution images featured in the GigaGalaxy Zoom project, launched by ESO within the framework of the International Year of Astronomy 2009 (IYA2009). The plane of our Milky Way Galaxy, which we see edge-on from our perspective on Earth, cuts a luminous swath across the image. The projection used in GigaGalaxy Zoom place the viewer in front of our Galaxy with the Galactic Plane running horizontally through the image — almost as if we were looking at the Milky Way from the outside. From this vantage point, the general components of our spiral galaxy come clearly into view, including its disc, marbled with both dark and glowing nebulae, which harbours bright, young stars, as well as the Galaxy’s central bulge and its satellite galaxies. As filming extended over several months, objects from the Solar System came and went through the star fields, with bright planets such as Venus and Jupiter. For copyright reasons, we cannot provide here the full 800-million-pixel original image, which can be requested from Serge Brunier. The high resolution image provided here contains 18 million pixels. First glimpse into birth of the Milky Way – For almost 20 years astrophysicists have been trying to recreate the formation of spiral galaxies such as our Milky Way realistically. Now astrophysicists from the University of Zurich present the world’s first realistic simulation of the formation of our home galaxy together with astronomers from the University of California at Santa Cruz. 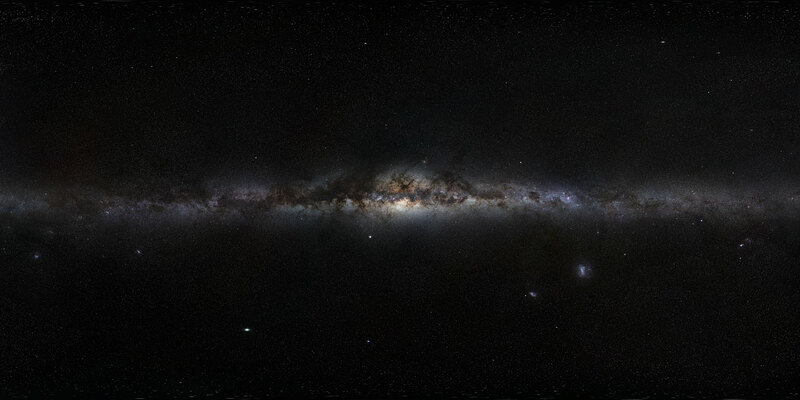 The new results were partly calculated on the computer of the Swiss National Supercomputing Center (CSCS) and show, for instance, that there has to be stars on the outer edge of the Milky Way. — After nine months of number-crunching on a powerful supercomputer, a beautiful spiral galaxy matching our own Milky Way emerged from a computer simulation of the physics involved in galaxy formation and evolution. The simulation by researchers at the University of California, Santa Cruz, and the Institute for Theoretical Physics in Zurich solves a longstanding problem that had led some to question the prevailing cosmological model of the universe. 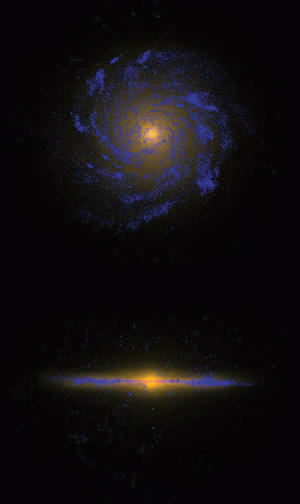 This image of the Eris simulation shows the stars in the galaxy as observers would see it. Blue colors are regions of recent star formation, while redder regions are associated with older stars. The spiral arms are typically star-forming, and the central bulge is basically "red and dead." “Previous efforts to form a massive disk galaxy like the Milky Way had failed, because the simulated galaxies ended up with huge central bulges compared to the size of the disk,” said Javiera Guedes, a graduate student in astronomy and astrophysics at UC Santa Cruz and first author of a paper on the new simulation, called “Eris.” The paper has been accepted for publication in the Astrophysical Journal.